This chapter of the book deals with the Kamakura Period (鎌倉時代 Kamakura jidai, 1185–1333). This period marks the transition of Japan to it's medieval era, which will last, for nearly 700 years until the Meiji Restoration. This period of Japanese history is marked by the governance of the Kamakura Shogunate, officially established in 1192 in Kamakura by the first shogun Minamoto no Yoritomo, who beating the rival Taira clan at sea, ended the Gempei War and established the Kamakura Shogunate. The Kamakura period ended in 1333 with the destruction of the shogunate and the short reestablishment of imperial rule under Emperor Go-Daigo by Ashikaga Takauji, Nitta Yoshisada, and Kusunoki Masashige. The Kamakura period marks the transition to land-based economies and a concentration of advanced military technologies in the hands of a specialized fighting class. Lords required the loyal services of vassals, who were rewarded with fiefs of their own. The fief holders exercised local military rule. This type of rule is known as feudalism. Once Minamoto Yoritomo had consolidated his power, he established a new government at his family home in Kamakura. He called his government a bakufu (幕府, tent government), but because he was given the ancient high military title Seii Tai-shōgun by the Emperor, the government is often referred to in Western literature as the shogunate. Yoritomo followed the Fujiwara form of house government and had an administrative board Mandokoro (政所), a board of retainers (Monchūjo), and a board of inquiry (Samurai-dokoro (侍所)). After confiscating estates in central and western Japan, he appointed stewards for the estates and constables for the provinces. As shogun, Yoritomo was both the steward and the constable general. The Kamakura shogunate was not a national regime, however, and although it controlled large tracts of land, there was strong resistance to the stewards. The regime continued warfare against the Northern Fujiwara, but never brought either the north or the west under complete military control. However, The 4th leader of the Northern Fujiwara Fujiwara no Yasuhira was defeated by Yoritomo in 1189, and the 100-year long prosperity of the north disappeared. The old court resided in Kyoto, continuing to hold the land over which it had jurisdiction, while newly organized military families were attracted to Kamakura. 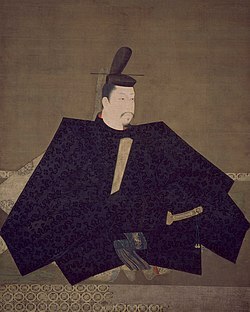 Despite a strong beginning, Yoritomo failed to consolidate the leadership of his family on a lasting basis. Intrafamily contention had long existed within the Minamoto, although Yoritomo had eliminated most serious challengers to his authority. When he died suddenly in 1199, his son Minamoto no Yoriie became shogun and nominal head of the Minamoto, but Yoriie was unable to control the other eastern warrior families. By the early thirteenth century, a regency had been established for the shogun by Hōjō Tokimasa—a member of the Hōjō clan, a branch of the Taira that had allied itself with the Minamoto in 1180. The head of Hōjō was installed as the regent for the shogun is called the Shikken in the period, although later positions were created with similar power such as Tokuso and Rensho. Often the Shikken was also the Tokuso and Rensho. Under the Hōjō, the shogun became a powerless figurehead. With the protector of the Emperor (shogun) a figurehead himself, strains emerged between Kyoto and Kamakura, and in 1221 the Jōkyū War broke out between the Cloistered Emperor Go-Toba and the second regent Hōjō Yoshitoki. The Hōjō forces easily won the war, and the imperial court was brought under the direct control of the shogunate. The shogun's constables gained greater civil powers, and the court was obliged to seek Kamakura's approval for all of its actions. Although deprived of political power, the court retained extensive estates. Several significant administrative achievements were made during the Hōjō regency. In 1225 the third regent Hōjō Yasutoki established the Council of State, providing opportunities for other military lords to exercise judicial and legislative authority at Kamakura. The Hōjō regent presided over the council, which was a successful form of collective leadership. The adoption of Japan's first military code of law—the Goseibai Shikimoku—in 1232 reflected the profound transition from court to militarized society. While legal practices in Kyoto were still based on 500-year-old Confucian principles, the new code was a highly legalistic document that stressed the duties of stewards and constables, provided means for settling land disputes, and established rules governing inheritances. It was clear and concise, stipulated punishments for violators of its conditions, and remained in effect for the next 635 years. As might be expected, the literature of the time reflected the unsettled nature of the period. The Hōjōki describes the turmoil of the period in terms of the Buddhist concepts of impermanence and the vanity of human projects. The Heike monogatari narrated the rise and fall of the Taira, replete with tales of wars and samurai deeds. A second literary mainstream was the continuation of anthologies of poetry in the Shin Kokin Wakashū, of which twenty volumes were produced between 1201 and 1205. Hōnen, founder of Jōdo shū (Japanese Pure Land Buddhism). Shinran, disciple of Hōnen and founder of Jōdo Shinshū sect. Ippen, founder of the Ji sect, which emphasized devotion to Amida Buddha through an ecstatic dance. Dōgen, founder of the Sōtō school of Zen Buddhism. Eisai, founder of the Rinzai school of Zen Buddhism. Nichiren, founder of the Nichiren Sect, which emphasized devotion to the Lotus Sutra itself. The older Buddhist sects such as Shingon, Tendai and the early schools of the Nara period continued to thrive through the Kamakura period, and even experienced some measure of a revival. However, with the increasing popularity of the new Kamakura schools, the older schools partially eclipsed as the newer "Kamakura" schools found followers among the new Kamakura government, and its samurai. The repulsions of two Mongol invasions were momentous events in Japanese history. Japanese relations with China had been terminated in the mid-ninth century after the deterioration of late Tang Dynasty China and the turning inward of the Heian court. Some commercial contacts were maintained with the Southern Song Dynasty of China in later centuries, but Japanese pirates made the open seas dangerous. At a time when the shogunate had little interest in foreign affairs and ignored communications from China and the Goryeo kingdom, news arrived in 1268 of a new Mongol regime in Beijing. Its leader, Kublai Khan, demanded that the Japanese pay tribute to the new Yuan Dynasty and threatened reprisals if they failed to do so. Unused to such threats, Kyoto raised the diplomatic counter of Japan's divine origin, rejected the Mongol demands, dismissed the Korean messengers, and started defensive preparations. After further unsuccessful entreaties, the first Mongol invasion took place in 1274. More than 600 ships carried a combined Mongol, Chinese, and Korean force of 23,000 troops armed with catapults, combustible missiles, and bows and arrows. In fighting, these soldiers grouped in close cavalry formations against samurai, who were accustomed to one-on-one combat. Local Japanese forces at Hakata, on northern Kyūshū, defended against the superior mainland force, which, after one day of fighting was destroyed by the onslaught of a sudden typhoon. Kublai realized that nature, not military incompetence, had been the cause of his forces' failure so, in 1281, he launched a second invasion. Seven weeks of fighting took place in northwestern Kyūshū before another typhoon struck, again destroying the Mongol fleet. Although Shinto priests attributed the two defeats of the Mongols to a "divine wind" or kamikaze, a sign of heaven's special protection of Japan, the invasion left a deep impression on the shogunate's leaders. Long-standing fears of the Chinese threat to Japan were reinforced. The Japanese victory, however, gave the warriors a sense of fighting superiority that remained with Japan's soldiers until 1945. The victory also convinced the warriors of the value of the shogunate form of government. The Mongol war had been a drain on the economy, and new taxes had to be levied to maintain defensive preparations for the future. The invasions also caused disaffection among those who expected recompense for their help in defeating the Mongols. There were no lands or other rewards to be given, however, and such disaffection, combined with overextension and the increasing defense costs, led to a decline of the Kamakura bakufu. Additionally, inheritances had divided family properties, and landowners increasingly had to turn to moneylenders for support. Roving bands of ronin further threatened the stability of the shogunate. The Hōjō reacted to the ensuing chaos by trying to place more power among the various great family clans. To further weaken the Kyoto court, the bakufu decided to allow two contending imperial lines—known as the Southern Court or junior line and the Northern Court or senior line—to alternate on the throne. The method worked for several successions until a member of the Southern Court ascended to the throne as Emperor Go-Daigo. Go-Daigo wanted to overthrow the shogunate to restore imperial rule, and he openly defied Kamakura by naming his own son his heir. In 1331 the shogunate exiled Go-Daigo, but loyalist forces, including Kusunoki Masashige, rebelled. They were aided by Ashikaga Takauji, a constable who turned against Kamakura when dispatched to put down Go-Daigo's rebellion. At the same time, Nitta Yoshisada, another eastern chieftain, rebelled against the shogunate, which quickly disintegrated, and the Hōjō were defeated. This restoration of the emperor is known as the Kenmu restoration and will be explored in the next chapter. 1185: the rival Taira clan is defeated at sea at the Battle of Dannoura by Yoritomo's brother Minamoto Yoshitsune. 1207: Hōnen and his followers are exiled from Kyoto or executed. This inadvertently spread the Pure Land doctrine to a wider audience. 1274: The Mongols of Kublai Khan try to invade Japan but are repelled by a typhoon. 1293: On May 27, a major earthquake and tsunami hit Sagami Bay and Kamakura, killing 23,034 people. It followed a 1241 and 1257 earthquake/tsunami in the same general area, which both were magnitude 7.0. 1333: Nitta Yoshisada conquers and destroys Kamakura during the Siege of Kamakura ending the Kamakura Shogunate. This page was last edited on 23 July 2016, at 13:44.